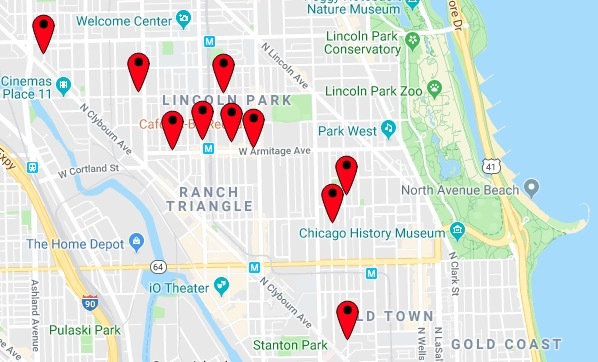 A solo burglar has been wreaking havoc in the Old Town and Lincoln Park neighborhoods over the past month, according to an alert from Area Central detectives. At least eleven homes have been targeted by the man, who enters residences by force or through unlocked windows or doors during morning and afternoon hours, according to the alert. He has taken computers, jewelry, camera equipment, credit cards, TVs, and cash during the crimes. • 1200 block of West Webster Ave., December 28, 2018 in the afternoon hours. • 2000 block of North Fremont St., December 28, 2018 in the afternoon hours. • 1100 block of West Armitage Ave.., December 28, 2018 in the morning hours. • 1800 block of North Cleveland Ave., December 31, 2018 in the afternoon hours. • 1800 block of North Cleveland Ave., December 29, 2018 in the morning hours. • 2000 block of North Sheffield Ave., January 7, 2019 in the morning hours. • 1700 block of North Mohawk St., January 7, 2019 in the morning hours. • 2300 block of North Bosworth Ave., January 10, 2019 in morning hours. • 900 block of West Webster Ave., January 11, 2019 in the morning hours. • 1200 block of North Schick Pl., January 15, 2019 in the morning hours. • 800 block of West Armitage Ave., January 15, 2019 in the morning hours. The police alert described the burglar only as an African-American man with short hair. Police are encouraging residents to keep their doors and windows secure. If you happen to fall victim to a burglar, do not touch anything and contact the police immediately. Anyone with information about this burglar may contact Area Central detectives at 312-747-8380 about pattern #P18-1-348D.